WE LOVE THE THURSFORD CHRISTMAS SPECTACULAR. Had a big table of the Thursford cast and musicians in last night. They are always a delight to look after. They really appreciate our food and service. They are like a breath of fresh air when they come each year. They are all full of sparkle and enthusiasm. A full restaurant of young aspiring dancers, actors and musicians is the best feeling in the whole wide world. Give us a call as we have had some cancellations for The Thursford Christmas Spectacular so we have some rooms available. Try us again if you were not lucky first time around. The clocks are going back and the weather is getting better. Easter is around the corner. There are many lovely things to do in Norfolk. Bluebell woods are plentiful in North Norfolk and there are many lovely walks to enjoy. The Peddars Way & Norfolk Coast Path starts in Suffolk at Knettishall Heath Country Park and follows the route of a Roman road to Holme-next-the-Sea on the North Norfolk Coast. At Holme the Peddars Way meets the Norfolk coast path as it runs from Hunstanton to Cromer. Fantastic scenery and landscape cover the 93 miles of the two trails of the Peddars Way and Norfolk Coast Path. The majority of the Trails run through the Norfolk Coast Area of Outstanding Natural Beauty and the Brecks, a unique area of forest, heath and low river valleys. All of Peddars Way can be reached from The Old Forge in ten minutes by car. Why not stay with us and enjoy this breathtaking scenery and return to a mouthwatering seafood meal using all local seafood from the Norfolk coast. Our photo shoot for promotion purposes has just been completed. The documentary should be out in November and Colin and I will be pictured in most of the TV mags. Don’t forget to watch the documentary, it is called “The Tripadvisors” a Cutting Edge documentary on Channel 4. Our special at the moment is scallops cooked in cream and sherry absolutely delicious as a main course. Thursford show is getting nearer so don’t forget to come and eat early with us before the show, we start at 4.30p.m. Just phone and book. Also we have some rooms left but not many!! The Thursford Christmas show is back soon. Starting on the 9th November until 23rd December. It is an all singing and all dancing Christmas spectacular and well worth a visit. We are just around the corner from the show and offer pre theatre meals staring at 4p.m in the afternoon. We also offer accommodation. We are getting very busy so please call soon for a booking. The show has an amazing array of professional singers and dancers and musicians. There is a comedian and ventriloquist who is brilliant. John Cushing who owns the show and writes it every year comes in every night to our restaurant to eat and we obtain tickets from him every year and are never disappointed. There is also a wonderful Christmas Wonderland for the children to visit, it is full of pretend elves and animals and of course Rudolph and the rest of the deer who pull Santa’s sleigh and at the end of the tour you can visit Santa himself who has a present waiting for you. Why not make a weekend of it and visit Holt Christmas lights as well as they are also spectacular. Holt is a Georgian town and is very beautiful at Christmas time with lots of lovely little shops down the Georgian cobbled side streets, great for Christmas shopping. Camilla, Prince Charles’s wife shops in Holt every year before Christmas. Bank holiday Sunday is the last day of filming us at the restaurant. It has been great fun. The Producer has recently filmed The Big Fat Gypsy Wedding. We are being featured in the Cutting Edge programme along with other establishments who are affected by the website Tripadvisor. The documentary should be very interesting – try to watch it!! This weekend there is a fantastic agricultural show at Aylsham, well worth a visit. It is a proper Norfolk show, full of real Norfolk people, no airs or graces, no trendy side stalls just stalls filled with local produce and lots of local animals being shown around the grounds. It is truly wonderful and great for the kids as there is a fun fair and lots of interesting local crafts to be seen. 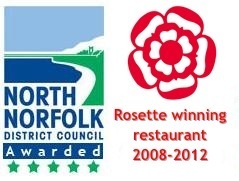 We love this show as it is REAL NORFOLK AT IT’S BEST. At nearby historical Walsingham there are the most beautiful snowdrop walks around Walsingham Abbey and surrounding historical buildings. Walsingham has a shrine to Mary and is regularly visited by pilgrims and is a beautiful village to visit and is steeped in history. Our building is 14th century with a gargoyle at the bottom of the stairs which is a sign that pilgrims rested here, worth a visit. Walsingham is five minutes away by car. We are only a ten minute drive away from The Dinosaur Park near Norwich. It is brilliant for the kids. Great walks through woods with dinosaurs in making lots of strange noises. A ride through the deer park and great play area. Our daughter loves the place. There lots of new dino’s there now as well. You can stay at our Bed and Breakfast and have a lovely local seafood meal and enjoy a day out at the Park. There are so many things to do in the area, there is Pensthorpe Park featured on Springwatch just down the road from us and so many other attractions in the area, the kids would not be bored and then there are the fantastic beaches ten minutes drive from us. Local international horse trials at Houghton Hall are commencing next week. This event is not just for international riders but for all the family. There is childrens entertainment, dog shows, side shows and it is a great day out for everyone. Why not bring your horse on holiday to our B&B. We have two stables and Bed and Breakfast accommodation and an award winning seafood restaurant. We are only fifteen minutes away from Houghton. You can now also compete in unaffiliated showjumping and cross country. There is an amazing raptor bird watching viewpoint just behind our Bed and Breakfast and seafood restaurant. Our family have been and watching these incredible birds is quite amazing. There are a lot of areas in North Norfolk for bird watching and it is often called a bird watching paradise. Our B&B is very central to all the salt marshes and heaths and of course the sea where a lot of twitchers gather. Our Bed and Breakfast is dog friendly so you can enjoy long walks on Holkham and Wells next the sea beaches which are renowned for their beauty.